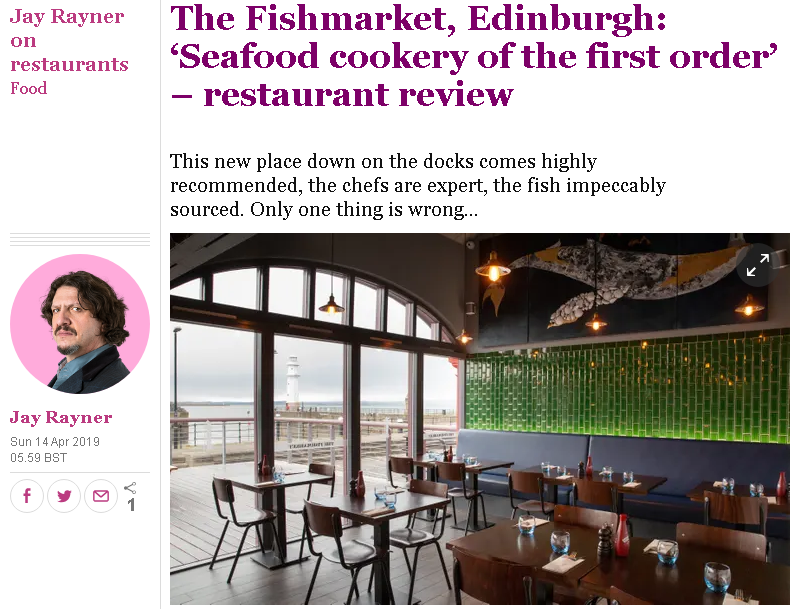 When in Edinburgh Jay Rayner for The Observer always heads to Ondine, and its “pitch-perfect seafood”; you can imagine how delighted he was to discover a sibling restaurant, “a collaboration between Ondine chef Roy Brett and his long-time suppliers Welch Fishmongers,” on the docks at Newhaven. At Fishmarket there’s a “classic metal takeaway counter” with “a simple dining room” beyond, “walls tiled in jade green and white”. No “view down the Royal Mile here,” just the “glitter and ripple of the harbour waters at night”. The takeaway does “standard chippy” fare, but in the dining room, “the menu is more expansive,” but it’s “not quite Ondine in trainers”. The prices are “too punchy for that, but then the good stuff still costs”. Crab claws made for a “satisfying plateful”; langoustine and “spoon-coatingly thick” smoked haddock chowder followed: “this is butch farmhouse cooking, pursued with acute attention to detail”. It all “bears the fat thumbprints of Ondine… seafood cookery of the first order, executed by a kitchen which understands that timing is everything”. And then the fish and chips arrived, and things turned “a bit weird”: “because the Fishmarket is the love child of Ondine I want to dribble and rave and cheer. But I can’t”. The fish was “just fine” (“given the lineage and the price, you need to be able to… leap to your feet and applaud”) and the chips were “pale and uninteresting… just disappointment, fashioned from dry matter”. They were “a promise, broken. If you’re going to eat chips, you need to feel that the calories are worth it”. 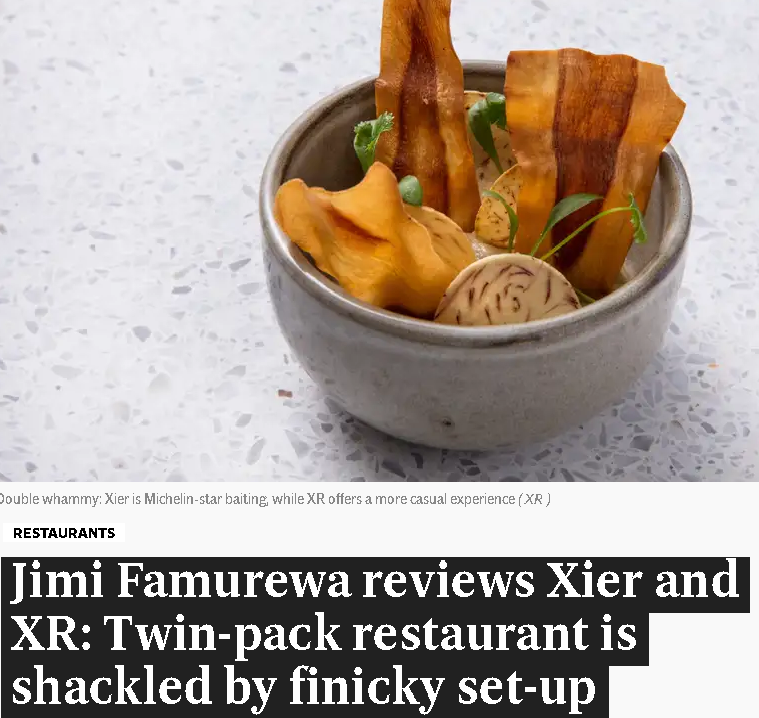 Jimi Famuwera for The Evening Standard felt “intrigued admiration” for Xier and XR before he visited – in this climate “it feels as though it is difficult to open one restaurant, let alone two” (especially with a name that sounds like a “provincial escape room”). Jimi tried the “more casual, modern European XR” rather than the £90+ “taster menu-only, Michelin star-baiting Xier” upstairs; his midweek lunch was “capable but only briefly spectacular”, and his “lasting impression was of imaginative cooking shackled somewhat by a compromised, overly finicky set-up”. “Terrific” sourdough and oddly Nordic canapes started the meal, followed by “oozy, unctuous” enoki mushroom and truffle arancini, mains that were “not bad necessarily. Just a bit of a slog” and “an amazing corpse-reviver of a coffee ice cream”. 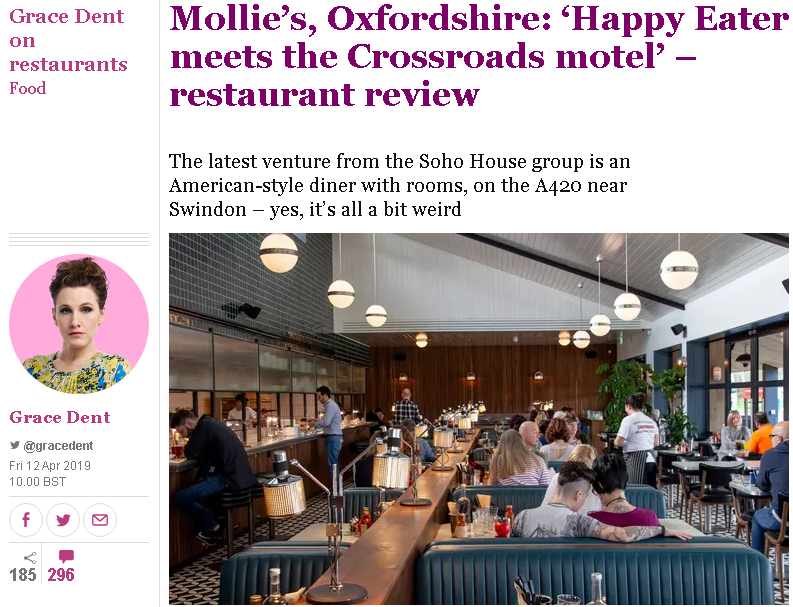 “Mollie’s is a cool blast of fresh air” for regular travellers, families and locals alike; the menu is “thoughtful, modern and slightly glamorous, and the food decent”. The “bartender will make you a very good old fashioned or even an espresso martini,” too (good enough that you won’t notice you’re sitting in the lobby). Her meals at Mollie’s included a buttermilk chicken sandwich with chipotle mayo that was “hot, fresh and alluring” and “waffles… the sweetest, crispest and freshest I have ever tasted”. 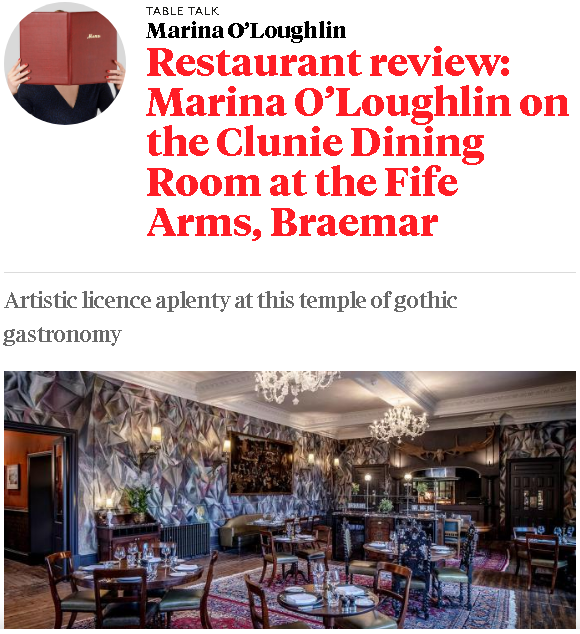 Marina O’Loughlin for The Sunday Times was “darkly cheerful” at The Fife Arms, a luxury Cairngorms hotel that’s been bought and gothically refurbished by “super-gallerists” Hauser & Wirth. “From outside, the hotel may look like the typical Victorian pile” – inside, it’s “possessed of an altogether more subversive agenda”. Picasso and Lucien Freud artworks decorate the walls, a drawing room “ceiling is painted in loud, dreamlike swirls by Zhang Enli”, “stairwells sprout taxidermy” and “in the back garden looms a Bourgeois spider”. The food in The Clunie Dining Room was “quite odd too”; there were “Scottish-isms on the menu, as you’d expect” but “the chef has clearly travelled beyond the Highland confines and is going all nouveau-northern: fermented kohlrabi, celeriac purée and shaved raw cauliflower with the langoustines, poor things”. One deer dish is “a curious mash-up between Neapolitan ragu and Sunday roast” – Marina detected “little care whether individual ingredients sing to each other or just squabble… Perhaps it’s art”? It doesn’t help that the food was “probably the least interesting thing about the Clunie Dining Room” – there’s a whole stuffed stag watching you eat, a mesmeric hand-painted mural painted on the walls with a “vast original Brueghel”. 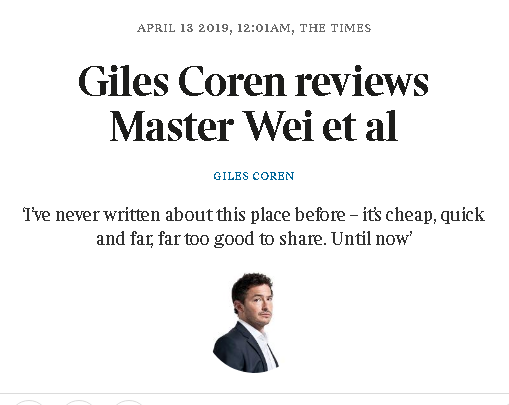 Giles Coren for The Times clearly wishes he was still in New York, so much so that instead of moaning about Midtown NYC restaurants, he created an entire article around the fact that he’d never head of the Midtown minker for London’s Holborn/Bloomsbury area (“the concrete basin between the City and the West End”). Here, there’s also alcohol to help wash down the “excellent pot stickers… sour and spicy pork dumplings in soup, or those wide, seemingly endless belt noodles Xinjiang-style”. Master Wei has a “fun and local feel” with “relaxed and jolly” staff and food that’s “as fresh, homemade and refreshingly different as ever”. 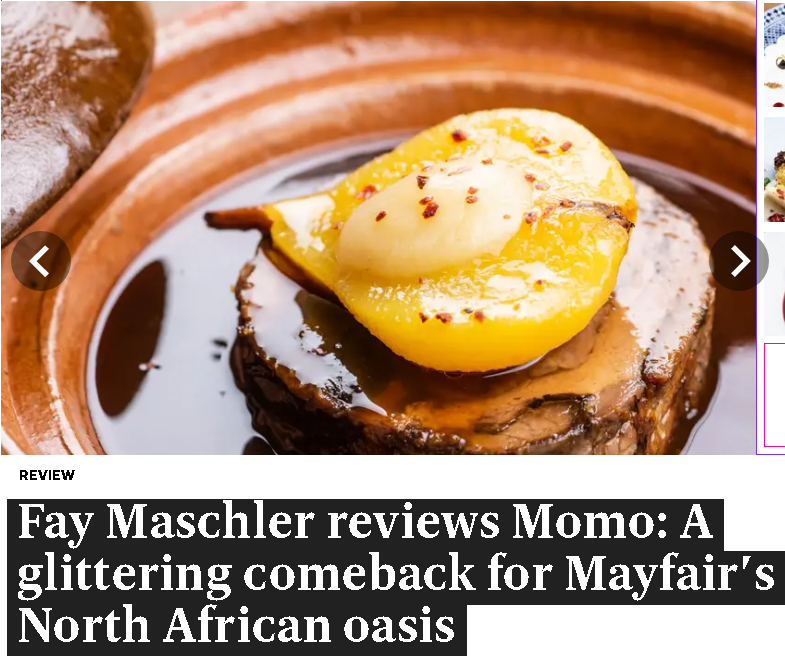 Fay Maschler returned to The Evening Standard after a few weeks away with a review of the refurbished, refreshed and re-opened Momo (and a few mentions of all the famous people she was with). The “newly beauteous space” has been “designed as an idealised glittering oasis”, the staff are “still attractively laid-back and keen to serve”, and there’s also a new menu (Mourad Mazouz has brought over Hervé Deville, the head chef from his ‘other place’, Sketch) in which the “North African inspiration is honoured” with “cohesion and an awareness of tradition that comes as a blessing and relief in the current flourishing of culinary gobbledegook”. 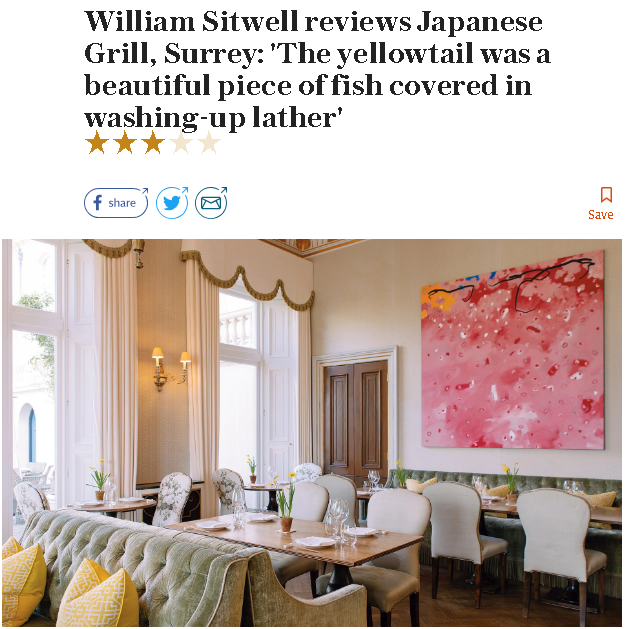 William Sitwell for The Telegraph was at Beaverbrook, “a hotel that nestles in 470 acres of beautiful Surrey countryside,” a little confused by the homely decor of the Japanese grill restaurant (until he found out it’s also where breakfast is served). This made it already “a few chopsticks short of authentic” in his mind – which only “put more pressure on the food”. The hotel, named for former owner Lord Beaverbrook, has had an “exquisite facelift” to the tune of some £90million. Overall, William decided that the food did not match the lavish surroundings in more than one way – it was just “not good enough”; ‘yellowtail tiradito’ was served with a “distracting yuzu foam” (“a beautiful piece of fish covered in washing-up lather”) while his monkfish was just “featureless bits of fish hidden in slimy mushrooms” and the sashimi selection “was not as good as a respectable local lunchtime sushi bar… memorable only for how many you had to get through”. 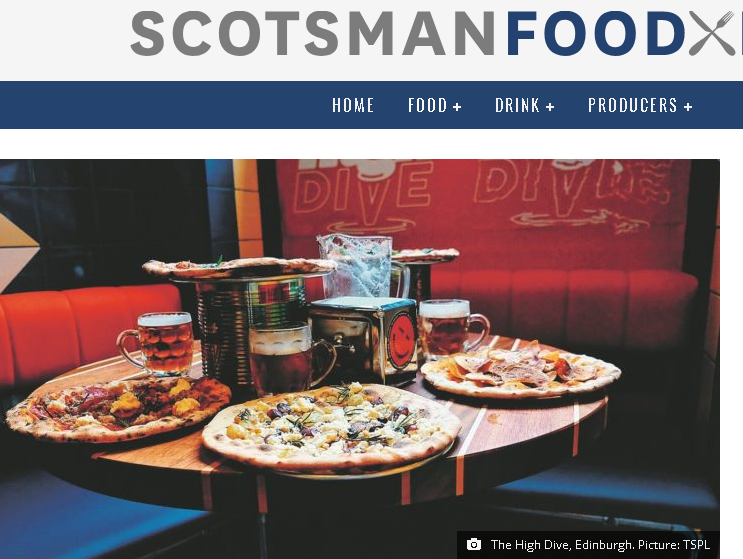 Gaby Soutar for The Scotsman visited The High Dive for “full flavour pizza and maximal decor”. Formerly The Maltings pub, “this place has changed an awful lot” and is now run by the team behind Edinburgh’s Civerinos. It sounds like a sensory overload, from the interior design that’s “the antithesis of the pared back pale wood aesthetic” to the pizza ‘pies’ with “original” toppings (“if the bases are a canvas, think magical realism, rather than a boring still life of flowers in a vase”). Tom Parker Bowles for The Mail on Sunday doled out another four-star rating to The Royal Oak, a Cotswolds pub now run by Richard and Solanche Craven, previously at The Chef’s Dozen in Chipping Campden. Anyway, this place is “a cut above the norm”, with a stripped-back room that’s always “bathed in natural light”. Starters ranged from “lusty farmyard fat” to “Nordic purity”: a “masterclass in simplicity and restraint”. Main courses had flavours that were “big and bold” – pig’s head and black pudding lasagne was “a symphony of softness” with a “sharply sweet cider reduction… a discreet, elegant, beautifully thought-out dish” – and side dishes added “stellar support”. In The Financial Times, Tim Hayward was at Credo in Trondheim, “a cathedral to hospitality… at no point does any course — and there are 20 — drop below exceptional”. Emma Elgee on Bristol Live reported on the opening of south American BBQ specialists Low and Slow and also Woky Ko in Bristol’s “iconic” foodie St Nicholas Market. Woky Ko (which already has three outlets in the city) replaces the troubled Grillstock (RIP), and will serve up robata sticks as well as other Asian fare. Emma Ryan in The Yorkshire Evening Post reported on the sad closure of Leeds veggie Indian stalwart, Hansa’s: Hansa and Kishor Dabhi “are retiring after 33 years at the helm of what is thought to be the city’s longest running independent Indian restaurant”. After closing the restaurant with a party, they “are looking forward to a night out of their own”. Fans should note that they “can still have a taste of Hansa’s cuisine as she will continue with her cookery schools as her retirement activity”. The Yorkshire Evening Post also reviewed The Swine that Dines, which was soundly praised for its ‘Pie Sundays, “dedicated to the deliciousness that is pie”, its “very welcoming and attentive host”, “heavenly” aligot (cheesy, herby mash), “amazing gravy” and “one of the best pies I’ve ever eaten”, all topped off with great desserts and a “charming, cosy and pleasant” atmosphere. News, Reviews Fay Maschler, Gaby Soutar, Giles Coren, Grace Dent, Jay Rayner, Jimi Famuwera, Marina O'Loughlin, The Evening Standard, The Financial Times, The Guardian, The Mail on Sunday, The Observer, The Scotsman, The Sunday Times, The Telegraph, The Times, The Yorkshire Evening Post, Tom Parker Bowles, William Sitwell. permalink.